What if the winter of life really was the best season — a time of completion and fulfillment, rather than a misery or a failure? And what if the primary problem wasn’t aging itself but the misguided tale we have learned to tell ourselves about it? In many cultures, elders play a variety of valuable roles and are respected, even revered. The Japanese, for example, regard their elders as “national treasures” and even have a word — shibui — for the beauty of age. And in societies where elders are valued, “You look old today” is a compliment. In the United States, though, a number of factors, including an exaggerated fear of death and the overvaluing of autonomy, appearance, and achievement, have led to an inaccurate view of aging as a humiliating decline into misery. Demeaning ageist stereotypes reflect our collective aversion to age and cause enormous suffering for older as well as younger people. Being an old woman is seen as a particular misfortune, rather than the blessing that it can be. In an environment where fear-based attitudes toward old age are so pervasive, it is easy to internalize them without realizing it. Some women resist these negative stereotypes by clinging to youth, investing in expensive products and procedures that promise to erase, or at least hide, the visible signs of aging. Most consider it high praise to assure a woman that she doesn’t look her age. But the subtext is hardly a compliment: to be her age is bad. At the other end of the spectrum are those who buy into the misconception that when youth fades it’s all over and simply resign themselves to an inevitable downhill slide. Sadly, the belief that later life is necessarily a time of debilitating decline usually goes hand in hand with a lack of health-promoting behaviors. Thus, many of us help bring to pass the very losses we dread. Thankfully, resistance and resignation are not the only ways to approach growing older, and there is mounting evidence that the dread of aging is more rooted in fear and fallacy than in fact. Another more encouraging version of the story of old is gaining momentum, one that acknowledges the losses of later life but also celebrates its gifts and graces. 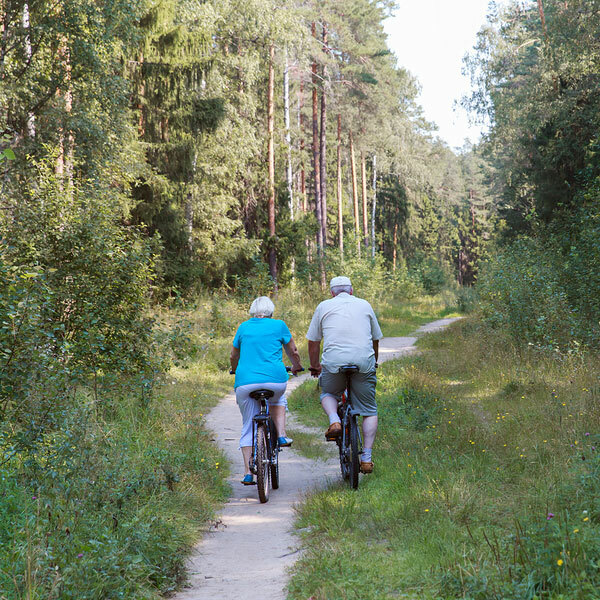 Most so-called problems of age are the result of inactivity and illness, not years, and can be prevented, delayed, or offset by not smoking and by regular exercise and other health-friendly practices. Catastrophic conditions mistakenly equated with age, such as severe dementia and debilitating physical frailty, are the exception, not the rule. The vast majority of people over sixty-five do not experience them. People age in widely different ways, becoming less alike as they grow older. We are not determined by our years, and chronological age is a fairly poor predictor of how people feel and act. Best of all, there are many positive trends in later life that have received far less attention than its losses, such as increased self-acceptance and tolerance toward others, enhanced creativity, a growing ability to savor life and to ride it ups and downs with equanimity and humor, and a deepening willingness to set aside our own interests for the greater good. . . .
Winter’s Graces is intended primarily for women in their fifties and sixties who are dreading what lies on the far side of midlife. Rare is the woman of any age who looks forward to growing old, but the need for good news about the winter of life is especially pressing in middle adulthood. We who are in the autumn of life are the wise women of tomorrow, and the world needs us to step into our courage, creativity, wisdom, compassion, occasional fierceness, and the rest of winter’s graces. The growing number of people over sixty-five represents an enormous potential resource for the human family, which desperately needs the steady, ingenious, compassionate wisdom of its grandmothers and grandfathers. . . . I hope that men and younger readers will find value here as well. If you are a young woman or one just entering midlife, may you be inspired to age in your own way, unencumbered by the constrictions of ageist stereotypes. Meanwhile, many of winter’s graces can be cultivated at any time, for your own and others’ benefit, and they do not spring up overnight. Ageism and sexism affect older men as well, especially the measuring of a man’s worth in terms of his income and productive power. My focus on the older woman is not intended to exclude anyone, but rather to honor the crone whose repeated “visits” inspired this project. Almost all of the research and theories of aging included here apply to men as well, unless otherwise specified. Male readers can find a wealth of elder tales and information on late-life development in Allan Chinen’s In the Ever After. Regardless of age and gender, I invite you at least to peek through the keyhole of the imposing door marked OLD AGE and see for yourself what might lie on the other side. Listen to the words of elders, ponder the scientific evidence, allow the stories of the old ones to permeate your soul, and give winter a chance to bless you with her graces. . . .
Winter’s Graces may be read in many ways — from cover to cover, or grace by grace, in whatever order you wish; playing with the questions and tools, or exploring the book in your own way. However you travel through these pages, may you find encouragement and nourishment. May you come to appreciate the graces of winter in yourself and in others and dare to share your unique version of them with the world. 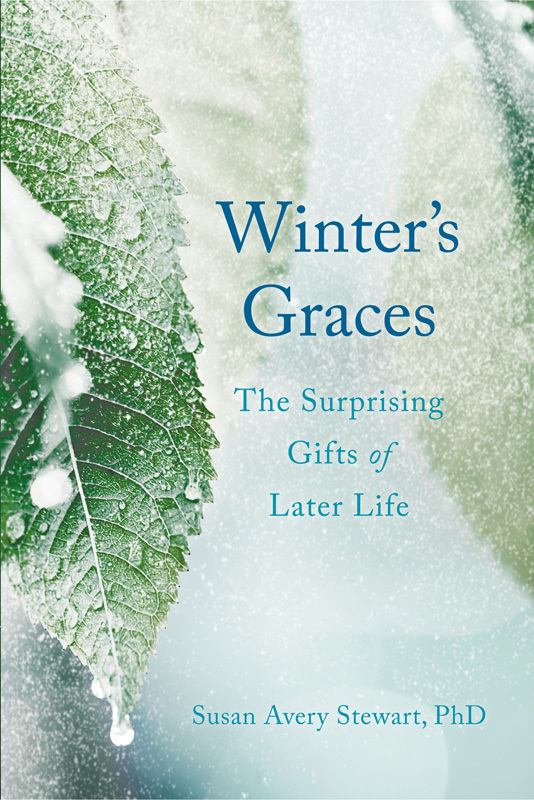 Susan Stewart’s book, aptly named Winter’s Graces, is full of grace. For me, reading it was like opening a treasure box and discovering that a time of life I was anticipating with some dread is actually rich in beauty and many other blessings. I envision groups of women coming together to receive its reassuring wisdom and to be awakened to the inviting possibilities that age has to offer. In this wise volume, Susan Stewart offers a compelling vision of what aging can be, not only for women but for us all. In particular, the eleven qualities she dubs as “the Graces of Winter” articulate a profound depth-psychological model, rooted both in contemporary cutting-edge research and ancient wisdom.